For decades, two aspects of nature have been either overlooked, poorly understood or misconceived.  The first is Anisotropic Dark Flow Acceleration (DFA).  The second is Relativistic Resistance against Motion (RR). The consequences for their inclusion will tremendously broaden our present picture of the Universe. Prediction: The special theory of relativity will begin to fall apart in 2019 / 2020 when the theory of relativity will be tested on board the ISS and Galileo 5 & 6. As technical development and experience have progressed through the decades, we have gained a greater insight into the nature of the cosmos; however, we are constantly facing new discoveries that simply cannot be implemented in the prevailing paradigm. For some time now, it has become increasingly apparent that the field of astrophysics requires new knowledge in order to understand and solve the growing list of perplexing kinematic anomalies and phenomena that have been discovered so far. This new theory will solve the long list of mysteries in a very natural way which, unfortunately, we have failed to properly understand so far. The beginning of the 19th century saw several mathematical paradoxes, partly deduced from the Lorentz transformation and partly from Maxwell’s equations. The essential aspects are: time dilation, length contraction, and the speed of light being constant regardless of the speed of the light source. Shortly after, the theory of relativity was developed, and for the first time, it was possible to relate to these mathematical discoveries. In the special theory of relativity, this necessitated a claim stating that there was no absolute motion reference frame. Already in 2019, (2020) we will see proof that this interpretation must be incorrect. The reason for these misinterpretations is the fact that Albert Einstein was only aware of length contraction and time dilation. He had no mathematical basis to claim or believe that the ruler is also deformed in proportion to time and space. We will soon see that exactly in this area, new knowledge will force us to modify the 100-year old theory. MTR is a further development of the theory of relativity and essentially simply claims that the ruler is also always a proportional transformation factor (logical suppositions justify this very necessary note). This simplifies the special as well as the general theory of relativity to one single expression: “Reality Transformation”, which means that everything is always proportion transformation factors (obviously only locally). This applies regardless of whether the relativistic transformation is caused by gravitational field influence or caused by relativistic motion. In simple terms, the new understanding of relativity means that: “our reality”-the world we see around us-as well as time linked to this reality is proportionally transformed (reduced or enlarged) due to effects from either a gravitational field or due to speed. Notice: the speed of light continues to be: “the same in all reference frames”, however, as the ruler is a proportional relativistic variable, ‘c’ is not comparably the same. Without it being necessary to venture into extreme speculations, it is (so far) easy to conclude that the universe as well as matter must have an elastic common denominator which must be: the nature of space. In the same way, the cause of gravity must obviously be found in the elastic character of space. Following a ‘red thread’ is therefore also unproblematic for the MTR theory to a far higher degree than expected, even to a degree where it can be concluded that the concept “dark energy” simply must be due to changes in the elastic structure of space. The distances in electromagnetic spectra are thus not stretched (expanding) while photons from distant stars travel towards us, but it is rather completely opposite; our physical reality is gradually being more and more contracted through billions of years due to the change (release of tension) in the elastic structure of space. Cosmological redshift is therefore in reality the evidence for: Reality Transformation. In other words: the cosmologic redshift indicates a universal gravitational field in constant change and obviously easily leads to the opinion that endless cycles of Big Crunch and Big Bang must be responsible for a race between increasing and decreasing tension in the structure of space which constantly affects the entire universe through billions of years. It is therefore implicit in the DNA of the MTR that the mass dissemination of the universe is limited but also that the universe must have its own acceleration due to gravity aimed at its own centre. At a more speculative level, it is uncomplicated to suspect the strong nuclear force to be responsible for absorbing and twisting space and therefore, as a result, responsible for space being stretched towards (space absorbing) matter (meaning an elastic matter-space connection) where the endless red thread (supported by well-known knowledge or observations) is also aiming. The weakness and problem with the Theory of Relativity is that the old theory never succeeded to explain the cause and effect of the so-called curvature of space, not even hypothetically, or how the cause of “curved space” was connected or caused by the presence of matter. Furthermore, one had to be satisfied with a rather superficial explanation claiming that the Lorentz Transformation was a result of relative motion in which an absolute frame of motion did not exist. Many have refused to accept that “relative motion” was the correct explanation and cause of Lorentz Transformations. Even though several mathematical as well as common sense-based thought experiments and disproof have been brought forward, the old theory has survived. The MTR theory claims that relativistic transformations are caused by a process where the strong nuclear force as well as the elastic nature of space play the only two main roles. The elastic property of space allows space to participate in a process where a given amount of energy is preserved. This includes the nuclear binding kinetic energy as well as kinetic and potential and energy. Energy as a whole is converted and conserved in one and the same process whereby the property of space as a common denominator always becomes the linkage between the strong force and all Lorentz Transformations. This necessitates the introduction of an ‘absolute movement reference frame’ in which movement and relativistic transformation no longer depend on movement relative to other objects but only is a question of “true movement”-always relative to absolute rest. Therefore, the greater part of the mathematical foundation of the old Special Theory of Relativity (hereafter STR) will remain unchanged in the MTR, however, the cause-effect of the Lorentz Transformation is now completely different, and the well-known nature of space is now much easier to adapt with well-known facts. Now it is therefore easy to predict that the old STR will break down when the theory is tested in an absolute reference frame. This is exactly what will happen on board ISS now. The result is expected ready in 2019 / 2020 1. Because the elastic characteristic of space is involved in the strong nuclear interaction process, it is natural to ask whether a critical limit exists for how much space can be stretched before a nuclear explosion will occur. At least, it must be obvious that the deeper into a gravitational field one gets, the more extreme the elasticity of space is stretched, and the more challenged the strong nuclear force is suspected to be. Endless cycles of dissolution and reformation of matter applies not only to supernovas but most likely also to huge clusters of galaxies as well as the central mass accumulations of the universe. If a Big Crunch triggers a Big Bang, matter and therefore also gravity will at first cease to exist in an increasing radius from the centre of the universe whereby mass will be attracted and instead aim towards other mass accumulations near the centre after which these will also explode as soon as space in these areas reaches a critical tension of space. After the first stage of Big Bang, the elasticity of space, which previously stretched towards the centre of the gravitational field of an old universe, now withdraws from these centres towards a state with no (less) tension. When central gravity of the universe disappears, the universe’s acceleration due to gravity will therefore gradually aim opposite the centre (towards the periphery) of the universe for a while. When the universe is cooled off, the strong nuclear force will emerge again, thus also gravity. Again, matter will aim towards the centre. Today, the dissolution of a previous universal gravitational field currently dominates because the decreasing effect has a head start compared to the effect that the reformation gravitational field of the new universe is causing. Therefore, the elastic withdrawal of the universal gravitational field dominates and continues, even today. However, at the same time, matter is again attracted by the recovered central gravitational field of the (new) universe, and everything is therefore again headed towards a new Big Crunch. Later in this paper, it will be shown how Dark Flow most likely must be understood as evidence for a Big Crunch taken place right now. Even though the red thread of the theory has been stretched as far as possible, it is not decisive to the primary message of the theory. This introduction should not be seen as the perfect image of a new paradigm, only a possible image, or rather a ‘template’ based on completely new knowledge. The central message, however, is that we will soon have proof of a serious weakness in the theory of relativity, which supports Dark Flow as being fact. Time will tell how exactly to bid the old picture of the universe farewell. An Anisotropic Dark Flow Acceleration exists. This claim is based on a kinematic analysis of 21 Allais Effect measurements. This aspect of nature is important to truly research and understand as it is one of the most important cornerstones in what will soon be the new paradigm. All measurements (without exception) substantiate that the Allais Effect is consistent with anisotropic acceleration and that the acceleration is directed in the same direction as Dark Flow. So far, Allais Effect measurements have taken place blindfolded. Now, it is possible to calculate and predict when and where the Allais Effect can be confirmed, and of course also predict where and why no effect can be confirmed. In addition, it is now also possible to calculate how strong anomalies can be expected, and even whether the effect can be measured before or after the eclipse reaches the maximum. Different pendulums are the most effective instrument to use. The reason why such strange devices are the best option is also no longer a mystery. This new theory also uncovers why advanced instruments only rarely have been successful to use, which also explains why such significant acceleration could have been hidden for such a long time. The exact magnitude of the anisotropic acceleration (possible to measure with different pendulums) is calculated to be around 35μGal (3.5*10-7m/s2), and not much deviation must be expected in the years to come. Since the first claim in the 1950s when it was described as an anomalous effect, experimenters using pendulums have sporadically noted slight deviations when an eclipse is underway. Economic Nobel Prize winner Maurice Allais first reported his observations in 1954 when he noted that the pendulum in his Paris laboratory demonstrated a slight change in the precession of its plane of oscillation. Repeating his experiment in 1959, he obtained similar results. Numerous scientists have attempted to recreate his experiment with some claiming success and others reporting no changes to the pendulum movement. Unfortunately, no theory has ever been able to explain why only some solar (and lunar) eclipses disturb different kinds of pendulums, or why the effect is sometimes delayed and sometimes happens before the eclipse, nor why different pendulums are sometimes able to measure the effect and gravimeters only very weakly or not at all. These days in darkness have now come to an end, and all these questions have now been answered. An Anisotropic Acceleration can now be mathematically proven. In order for a significant anisotropic acceleration to be measurable on Earth, specific conditions must be present. It is somewhat similar to the situation that it is also impossible to measure the acceleration of Earth’s orbit acceleration from Earth (given that everything on Earth is part of the same acceleration frame of reference). However, there is an indirect method of measuring Dark Flow Acceleration (in short DFA), which is the same force / acceleration responsible for the Allais Effect 2, 3.  The Earth must accelerate slightly opposite to DFA (towards north), and the cause of the acceleration must be due to the force of gravity of the Moon.  A testing body on Earth (able to interact/measure DFA) must be (more or less) unaffected by the force accelerating Earth’s opposing DFA.  The rotation of the Earth must bring a measurement device to the best possible position whereby the testing body (of the measurement device) (more or less) can interact with the exposed DFA.  The pendulum must swing east-west, not north-south. Two independent observations and measurements based on NASA and ESA research have confirmed that Dark Flow could be true 4, 5, 6, 7. According to a NASA team led by Alexander Kashlinsky, the Dark Flow is directed towards the area between Hydra, Vela and Centaurus (Figure 1). The latest WMAP confirms temperature variations in the form of spherical harmonic oscillation that seem to be relative to the movement of the Earth. These temperature variations are neatly separated in the northern and southern sky relative to the geometry of the ecliptic plane of the solar system. Also the Cosmic Microwave Background Radiation seems to be slightly warmer in the direction of movement of the Local Group of galaxies that includes the Milky Way galaxy. 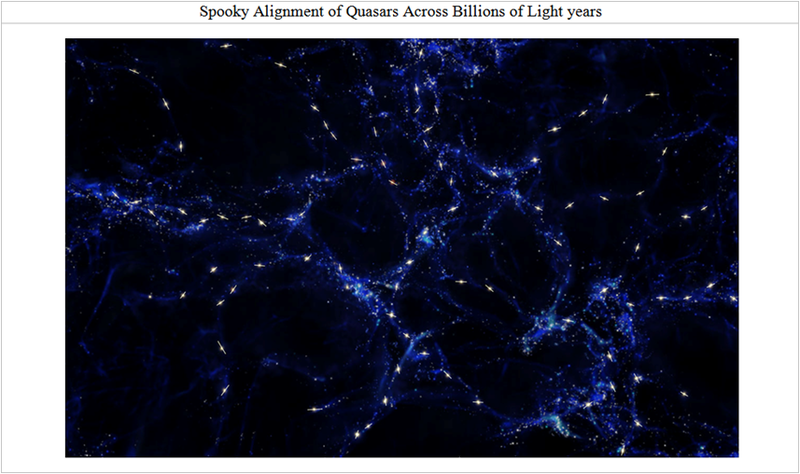 This connection or alignment has been named “the axis of evil” because of the possible controversial interpretations, and thus the potential damage it can do to current big bang and standard cosmology theories. Still, dark flow has not been definitively proven, however, it must be noted that the possible cause of the Allais Effect, (an anisotropic Dark Flow Acceleration), can very easily adapt to observations based on the latest WMAP data. Numerous Allais Effect research measurements during the decades have shown that an unknown force (at the minus 7 scale 8, 9, 10, 11) is occasionally exposed by a solar eclipse. Recently, this force has also been measured by lunar eclipses. Sometimes the effect is weak, sometimes strong, and sometimes no effect has been measured. Now, for the first time ever, a new theory is able to explain and mathematically prove exactly why these phenomena have been so mysterious. The crankshaft responsible for these phenomena is the motion of the Moon. Sometimes the Moon is situated above the Earth, sometimes below. 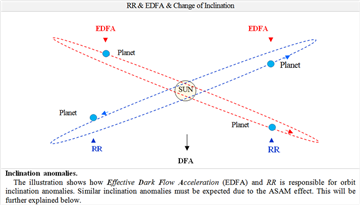 Due to mass attraction between Earth and the moon, Earth is sometimes periodically accelerated slightly upwards (or downwards) on what is here called a Dark Flow Acceleration Axis (Figure 2 below). Solar Eclipses are perfect occasions where the slightly upwards or downwards acceleration of the Earth undergoes remarkable changings. This is why eclipses are perfect occasions where the exposure of DFA can happen for short time periods. The cause of all kinds of Allais effects is that the Moon can prevent the Earth from following the dark flow acceleration (against south) for a relatively short period of time-but the Moon cannot (always) prevent the testing body from doing so. Figure 2. The illustration shows a solar eclipse where the moon is located 2000 km higher relative to a parallel, linear line, ‘X’, between the Sun and Earth. This corresponds to approx. 0.3°. In that way, the Moon’s force of gravity pulls the Earth in the northern direction with an acceleration which can be calculated 0.00000020m/s2 (20 μGal).  Testing body A (see illustration) will therefore not be directly affected by the upwards pull from the Moon, but only indirectly affected by the Earth’s upward acceleration and is thus exposed to influence by DFA as long as this body is not connected with Earth.  On the other hand, testing body B (near the Equator) will almost be in the same frame of reference as the accelerating globe and will therefore be exposed to DFA to a far less degree (because testing body B is also pulled upwards by the Moon).  Testing body D (and others located south of B) is not exposed to DFA influence at all as these testing bodies are all accelerating upwards, pulled by the Moon.  Testing body C is fully affected by the upwards acceleration of the Earth (in the same acceleration reference frame) and is therefore not exposed to DFA.  Testing bodies located between A and up towards C will gradually be more affected by the Earth’s upwards acceleration and will therefore also be poor testing areas for detecting pendulum anomalies. The image above illustrates (a huge, exaggerated) pendulum swinging on Earth. 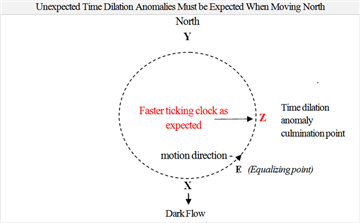  Figure 3-If the pendulum swings exactly 90° east-west (between A and B) relative to the DFA axis, only an insignificant anomaly will occur (when DFA is exposed)-because there are no anomaly escalating acceleration taking place.  Figure 4-If the swing angle relative to dark flow is a little larger or smaller than 90°, for example as illustrated by Figure 4 (motion from C to D), remarkable anomalies can be detected. Due to the pull of DFA, the path that the pendulum follows will (in this case) rotate anticlockwise, and the pendulum will increase its kinetic energy (because the anomaly is now escalating).  Figure 5-When the pendulum moves from D to E, the upwards acceleration of Earth will also force the pendulum to rotate as well as continue to increase its kinetic energy.  Figure 5-However, when following the path from E to F, the opposite influence is expected. The Resulting Force (RF) (of the Sun and Moon) acting on Earth must point as vertical as possible (Figure 9 a) to be able to accelerate the Earth upwards fast enough in order to expose DFA. Before a solar (or lunar) eclipse, the RF is pointing mainly horizontally. Twelve hours before an eclipse, the angle (where RF is pointing) starts inclining. Eight hours before an eclipse, this angle is 22.5° vertically, and four hours before a solar eclipse, the angle is 45° vertically (Figure 9 b). Finally, during an eclipse, the angle of the RF is completely 90° vertically (Figure 9 a).  8 hours before an eclipse, the RF is pointing 22.5° vertically.  4 hours before an eclipse, the RF is pointing 45° vertically.  4 hours after an eclipse, the RF is pointing 45° vertically.  8 hours after an eclipse, the RF is pointing 22.5° vertically. The required vertical upwards acceleration of the Earth is unique only during solar and lunar eclipses. The 8000 km radius of the abstract circle (on the Sun) is based on the angle between the moon and Earth at 0.6° (which is perfect for pendulum measurement). The perfect position for measuring the Allais Effect with a pendulum is when the Moon accelerates the Earth slightly upwards without also directly pulling/accelerating a test pendulum upwards. This means that the Moon prevents the Earth from following the Dark Flow Acceleration, but the moon cannot (always) prevent a testing body from following Dark Flow (at least not for a short period of time). Both experiences and calculation (see Figure 10) show that the period during which the Allais Effect can be measured is not only a few hours but rather +/-12 hours. Also notice that it takes the moon 24 hours to reach a 0.72° higher or lower altitude. When the Moon is lower or higher relative to P5, this will naturally affect the magnitude of the anomaly as well. Several pendulum measurements show that the Moon must be about 4000 km above the horizontal ecliptic in order to have maximum strength to accelerate the Earth upwards enough for a significant Allais Effect to be measured. The Perfect Position of the Moon (P5) is where the maximum anomaly is possible to measure (using different pendulums). Any position lower or higher than this will weaken the anomaly. Because the moon inclines or declines 0.72° (within 24 hours) relative to the perfect position, this can naturally seriously weaken the anomaly. Based on all the measurement experience we have, there is reason to conclude that it must be possible to trace a tiny rest of the anomaly even within a range of 24 hours. The reason that it is easy to believe the anomaly is short-lived is that this is only true seen from a local perspective, not seen from an overall perspective. This claim is already supported by evidence. The measurement of 1 August 2008 that took place in Ukraine and Romania was far away from the shadow of the moon. The onset of the Allais Effect anomaly was several hours delayed. The anomaly was measured several hours after the Solar Eclipse was over. The cause of this delay is that testing bodies A1 and B1 (in Romania and Ukraine) should first be brought to the "perfect position” (to position A2 and B2) by the rotation of Earth. The effect on testing body B1 was more delayed than the effect on testing body A, simply because the distance to travel from B1 to B2 was larger than the distance between A1 and A2. There is no doubt that if there would have been a measurement taken between A1 and A2, (Figure 12) these too would have shown the anomaly-however, not as delayed as in Ukraine and Romania. Due to the fact that no worldwide coordinated research has ever been executed, we can only guess what would have happened if measurements had also been taken further west (that day)-in Northern Italy, France, a few places in the Atlantic sea and in America. Would the anomaly also be measured here as well? The answer is YES-but the answer is also that the maximum effect would only have been measured one place on earth. If worldwide measurement would have taken place, it would have revealed an anomaly increasing half a day before a solar eclipse, and gradually fading out half a day. Now let us try to test this theory in reality based on all the Allais Effect measurements that have taken place during the decades. At the solar eclipse, the Moon was about 1° (6600 km) above the Sub Solar point. This corresponds to an upwards acceleration of the Earth at 37 μGal. (3.5*10-7m/s2). But at the same time, the Moon was also 0.3° above the measurement position (in Paris). This corresponds to an upwards acceleration of the testing body at 12μGal. The magnitude of the exposed DFA able to affect the testing body at that time of the day must therefore have been a total of 37μGal, (minus 12μGal) = 25μGal. (Figure 15 & Figure 19). On that same day, Marius Alias also took measurements in Paris and detected the Allais Effect. This measurement was taken in the autumn where the tilt of the axis of the Earth had brought France and therefore the measurement device about 3000 km further north compared to summer on the northern hemisphere (Figure 17 & Figure 18). The best possible measurement result must be expected when the testing body can ‘disconnect’ from earth’s upwards acceleration. This is possible when the DFA direction is visible on the southern horizon, or in other words: the strongest Allais Effect must be expected when the DFA axis and the DFA Interaction axis are parallel as illustrated by Figure 20. The bad alignment with the DFA interaction axis is the cause of the effect measured in 1959 being weaker compared to 1954. The conclusion is therefore that the bad DFA interaction axis is a stronger negative effect compared to the 12μGal upwards acceleration of the testing body in 1954. (Figure 16 & Figure 19) 3 Read more about also a lot more Allais Effect measurement support that an anisotropic acceleration is causing these phenomena’s 14. We know that it requires ever more energy to maintain constant acceleration. In the 70's we saw both Pioneer space probes decelerating unexpectedly 15. Not everybody agrees that NASA really solved the problem why. 16. The MTR claims that resistance against motion happens by constant speed. Soon (within a year or two) it will be beyond any doubt that a braking force must exist. If that was not true, Dark Flow Acceleration would force the universe to go mad (reach speed ‘c’) within only 20 million years. We will very soon be forced to reconsider whether we recently were on the threshold to a new physic that unfortunately was swept under the carpet by NASA. We will refer to this as Relativistic Resistance against Motion (Hereafter “RR”). This, of course, means that Newton’s first law is incorrect, and it means that all orbits are periodically instable. The cause of this is that the speed increment of an object causes energy and therefore also mass increment. Due to mass increment, the (so-called) curvature of space near a moving object also increases. Space resists deformation (e.g. the release of tension of space results in a gravitational wave). There are several reasons to believe that the process by which kinetic energy converts to the mass/energy is a reversible process. Space must have some kind of elastic nature woven together with matter, allowing space to convert and conserve relativistic energy to reversible elastic space deformation / tension. We have recently discovered several space probe anomalies, some decelerating, and some accelerating. The biggest mystery has been why only small objects were affected and apparently not bigger objects such as astronomic objects. The answer is that all objects and all orbits are in fact affected, but many anomalies cancel out after a certain period, some have not yet been discovered, some depend of orbit inclination, some are insignificant, and some are only active in certain periods. Even Earth is constantly affected. As a whole, RR and DFA have several significant consequences. These can be verified and recognised in many orbits and trajectories. On the biggest scale, galaxies and clusters of galaxies are affected as well. The same law of nature is responsible for the strange orbits and motion that ‘we’ believe is caused by so-called dark matter. Thinking of RR as a reversible process combined with DFA leads us to a different understanding of the nature of the Universe whereby a long list of kinematic orbit and trajectory anomalies and mysteries are solved nearly automatically 17. As long as there is no orbit acceleration or motion away from the Dark Flow Direction (hereafter DFD), the maximum Dark Flow Speed (DFS) will be reached. As soon as this happens, the Dark Flow Acceleration (DFA) and Relativistic Resistance against Motion (RR) counteract each other. Both factors are possible to calculate because the speed of Dark Flow is known (600kms-1). What remains is therefore only to calculate the magnitude of RR by that speed based on the assumption that 600kms-1 must be the maximum possible Dark Flow speed, and the magnitude of DFA is thereby also (indirectly) known. (See the graph, Figure 21). Figure 21. 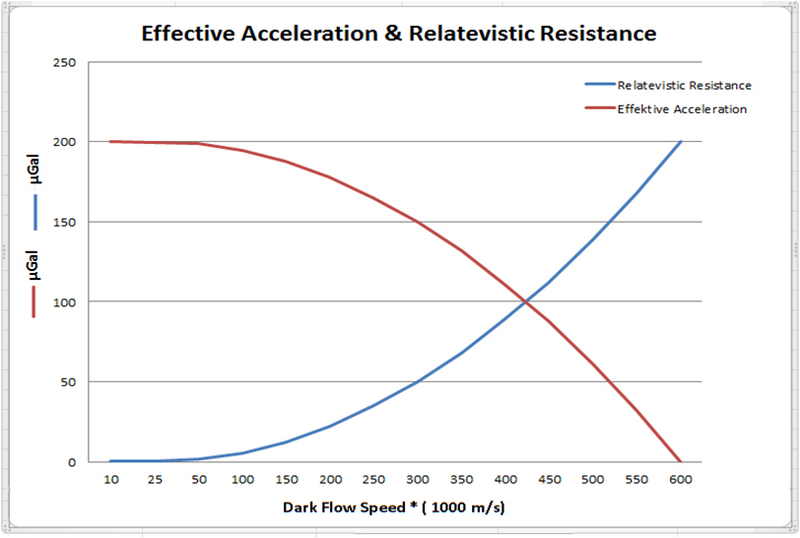 This illustration shows that as soon as the maximum dark flow speed has been reached, Dark Flow Acceleration and Relativistic Resistance counteract each other. The magnitude of RR (seen from an absolute motion frame of motion) always depends on true speed (Figure 22). When the dark flow is e.g. 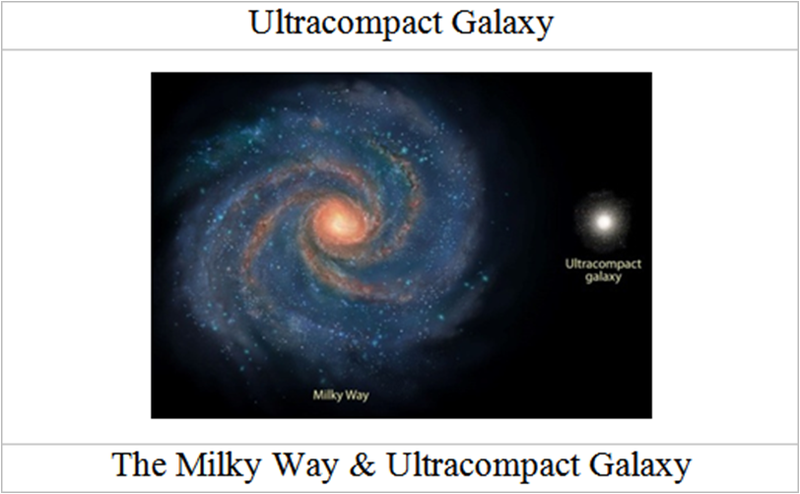 600 kms-1 and a galaxy moves in the opposite direction at 250 kms-1, the true, absolute speed of this galaxy is reduced to 350 kms-1. Notice: any object that moves at the maximum DFA speed will not accelerate (illustrated by Figure 22), but objects moving opposite DFA (by lower absolute speed) will accelerate towards DFD. 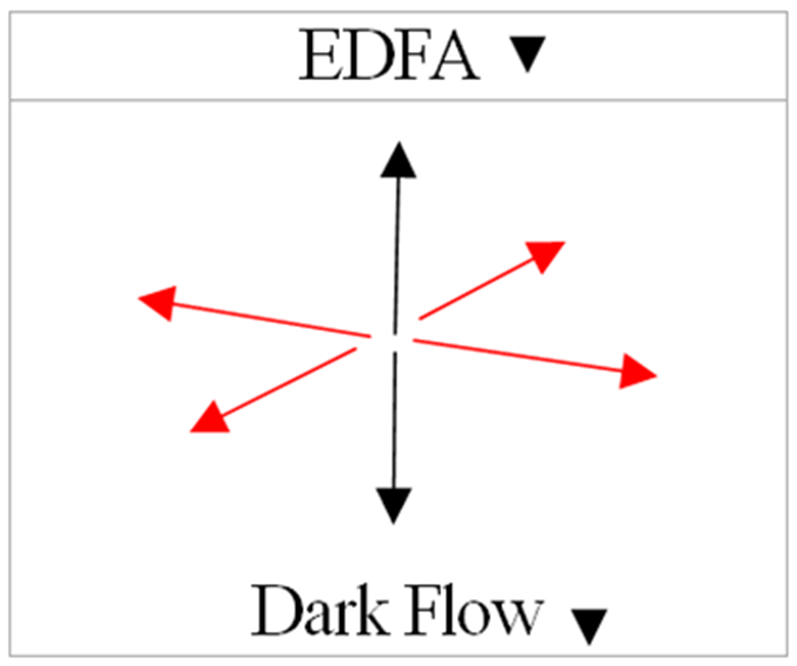 We will refer to this as Effective Dark Flow Acceleration EDFA. RR is the same magnitude due to any movement perpendicular to the Dark Flow Direction (DFD) axis (see red arrow Figure 24) as it is moving straight towards DFD while it is gradually decreasing, starting from perpendicular movement to movement opposite to DFD (any northern direction). Seen from a local perspective, absolute motion (for instance of the Earth or Solar System) towards any direction is affected by RR. Regardless of the basic absolute motion speed of the astronomic object, RR must always be calculated based on the RR-Lorentz equation based on a certain reference frame. Even though Earth is already travelling fast (for example 300 kms-1), this already affects the reference frame (time and distance) on Earth. 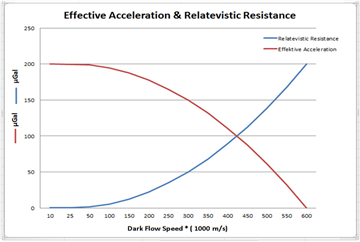 Any additional speed relative to the Dark Flow Speed (DFS) triggers additional (local) Relativistic Resistance against Motion (RR), and any reduced speed relative to the Dark Flow speed reduces RR. The magnitudes of space probe anomalies depend on true absolute speed. 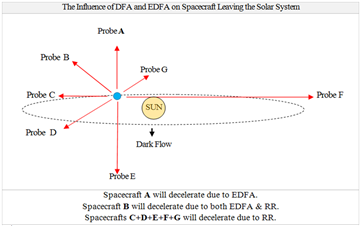 RR effecting the 2 mentioned space probes only represent a very weak deceleration most likely not significant enough to extract from the ISS data. However, unexpected time dilation is easily revealed. Time dilation is a consequence of absolute motion. If the absolute motion is increasing, the result is: a clock will tick slower. The other way around: if absolute speed is reduced, a clock will tick faster. Therefore, it is interesting to test spacecraft moving more or less on the Dark Flow Axis and in theory periodically increasing and decreasing their absolute speed. In the following calculation and of simplicity reasons, we assume that the ISS would follow an orbit completely perpendicular relative to ecliptic. However, it is not so simple because also the ASAM effect has a time dilation effect. During these periods, the ISS is moving from ‘X’ to ‘E’ (Figure 25), the average time dilation due to SR influence will in total only be 50% of the expected amount. At ‘E’, time gained and loss of time will equalize. When moving from ‘E’ and to ‘Z’, the clock on board ISS will gradually begin to tick faster, starting right after leaving ‘E’ and culminating at ‘Z’. 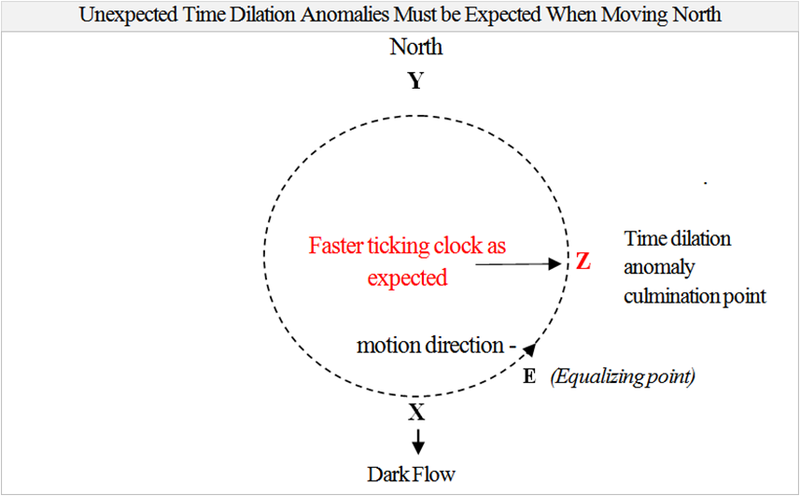 At ‘Z’, the SR-time-dilation “anomaly” will reach the culmination points that demonstrate the biggest discrepancy between expected time dilation according to the prevailing and modified theory of relativity. At Z, the dark flow speed is reduced by 7660 ms-1 1/sqrt 1-76602/2997924582)-1 which means that time will tick 3.26e-10s. faster according to MTR, and not 3.26e-10 slower according to the Prevailing Theory of Relativity (PTR). This means that half of such an orbit will have an SR time dilation effect. 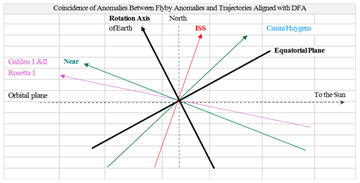 But the inclination of the ISS is not aligned with the dark flow axis; it is, however, inclined relative to that axis somewhere between 20° to 25°, and we should therefore only expect an approximate time loss of about 5.0e-8s. Of course, the same principle applies to all kinds of orbits, and also the Galileo 5 & 6 satellites now dedicated for scientific tests. 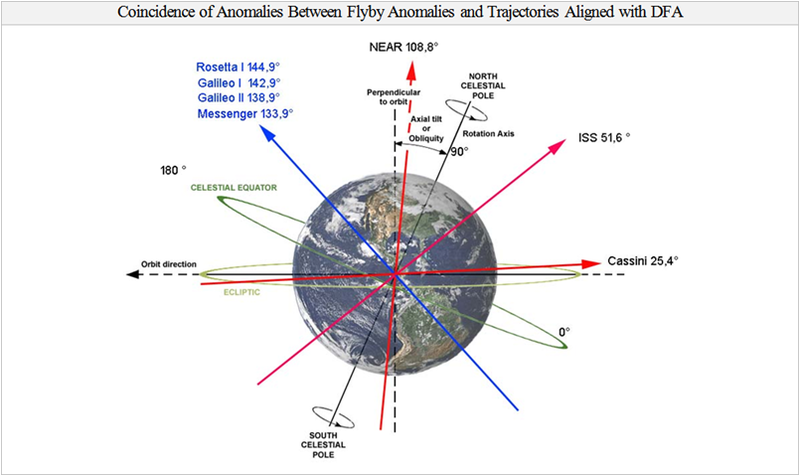 In the following calculation and of simplicity reasons, we also assume that the Galileo Satellites would follow an orbit completely perpendicular relative to ecliptic. The orbital period = 46800 seconds. A quarter of that period (11700 seconds) is where the Galileo will gain time due to a gradually slower absolute dark flow speed. Speed is 3800 ms-1. This means that half of such an orbit we will see no SR time dilation effect.  The effective average speed = half of the orbit speed: 3800 ms-1 /2 = 1900 ms-1.  The average time dilation factor : 1/sqrt(1-19002/2997924582)-1 = 2.0e-11.  The total unexpected loss of time per orbit rel. to a clock on Earth: 11700 * 2.0e-11 = 2.34e-7s.  The gain of time for the other quarter of the orbit relative to a clock on Earth: 11700 * 2.0e-11 = 2.34e-7s. 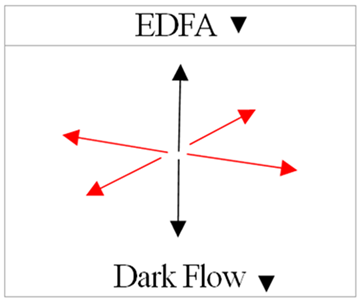 When an object moves opposite Dark Flow, RR will be reduced, but the Effective Dark Flow Acceleration (EDFA) (page 29) will increase correspondingly. When the ISS moves from ‘X’ (Figure 26) and forwards to the RR Culmination point ‘C’, the ISS will feel an increasing Effective Dark Flow Acceleration (EDFA), therefore decelerate and lose altitude. To be able to calculate the influence of EDFA, the following equation has to be used. 1m/s2-1 m/s2/sqrt(1-v2/c2)-1m/s2-1 m/s2/sqrt(1-38302/2997924582) = 8.16e-11 m/s2. Seen from a local perspective, kinetic energy is lost. This is not the shared point of view seen from an absolute motion perspective. The last three calculations (right above) are all based on orbit inclination aligned with the dark flow axis. In these cases, the loss of altitude is a deceleration (escalating) effect. It happens because motion away from the DFA will expose EDFA. However, since orbits very rarely are inclined to be completely aligned with the DFA axis, the altitude loss is much less. 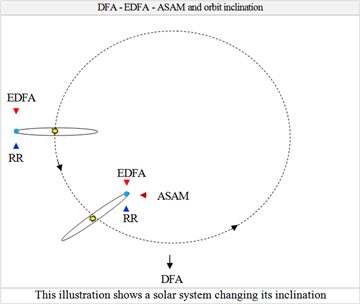 The very last calculation shows the inclination of a satellite orbit when aligned with the DFA axis based on the same distance as between the Sun and the Earth. Such a satellite will lose a significant altitude and speed. 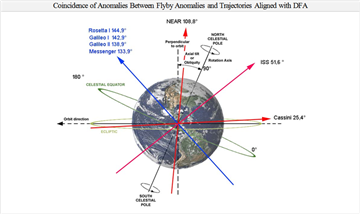 EDFA is by law of nature responsible for Flyby anomalies, and it is a significant factor contributing to perihelion precession anomalies 18.  That precise measurements on board the ISS (and Galileo 5 and 6) will contradict the theory of relativity-whereby the theory in its current form simply cannot survive.  That the cause of the unexpected result can only be that an absolute relativistic movement direction frame exists.  That the Special Theory of Relativity can only be properly understood in such an absolute movement frame of reference.  That the theory of relativity must be completely reconsidered.  That we are forced to critically review the foundation of the theory of relativity and (on the one hand) consider which aspects of the foundation substantiate the existing knowledge we have of e.g. GPS and (on the other hand) which aspects of the theory must be based on wrong conclusions / interpretations.  That the current interpretation of the Michelson-Morley experiment must be reconsidered.  That the only candidate able to explain the correct interpretation of the Michelson-Morley experiment is the gravitational field of Earth which must consist of the same elastic "substance" as the aether. The aether therefore follows the Earth, and therefore the aether does not collide with the Earth.  That the ISS measurement substantiates / proves that Dark Flow is real.  That the ISS measurement evidently confirms that there has been no reason to reject the aether theory.  That we are back in the end of the 18th century where it was found that “aether” must exist. Well-known problem with the theory of relativity. The MTR theory asserts that simply by modifying the expression “curvature of space” to “elastic stretching space”, several interpretations are completely different, and a very long list of mysteries almost automatically solved. The Modified Theory of Relativity (MRT) …. 1. Allows a simple and natural explanation of what dark energy really is-just the opposite of gravity-release of stretching (tension of) space. 2. It even explains why so-called dark energy (release of space tension) is “accelerating”. 3. It makes it possible to connect elastic space, matter and the strong nuclear interaction. 4. It makes it possible to understand gravity as a side effect of the strong force and therefore united. 5. It can explain the perihelion anomaly only based on Newtonian classic physics. 8. 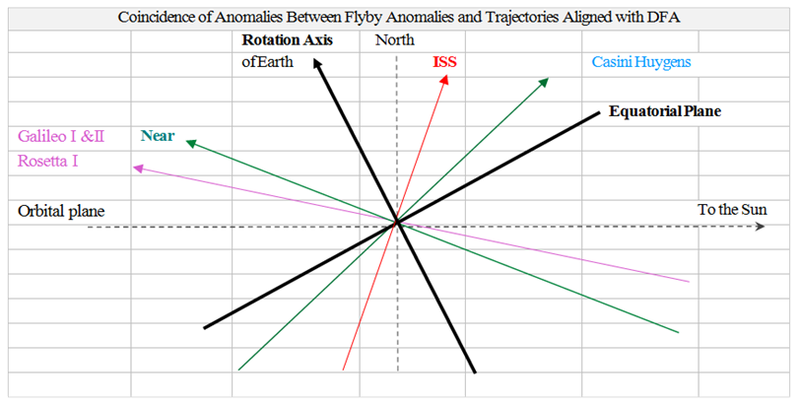 It can predict a SR anomaly-ISS test anomaly. 9. 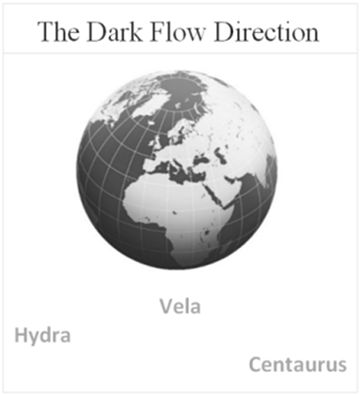 It can predict and prove that Dark Flow is true. 10. It solves what Dark Matter really is. A thought experiment will be necessary to demonstrate what has been misunderstood. ‘A’ lives in the basement of a skyscraper, ‘B’ at the top of the same building. Two photons will travel to B, one is detected, the other reflected to B in the cellar. This mean the 2 photons have (mainly) followed the same path. Both A and B have measured the time it took the two photons to travel 13.7 billion years from the very first star to us. However, as we know, A’s clock (deeper in the gravitational field) is ticking slower than B’s clock. B would argue that it took the photon one minute longer to reach the Earth than the time A has measured, simply because B’s clock is ticking relatively faster than A’s clock. In reality, the difference is less, but that does not mean anything. The experiment could happen in the future where the distance could be a billion times larger. The point is the same. We accept that speed “c” is the same for both A and B. Because A and B both measured the time it took the two photons to reach us, and because both A and B also agree that the speed of the photon must be the same (‘c’), A and B can only conclude that either the distance to the star that emitted the photon is significantly different (which is utopia because the universe is not likely to change shape depending on the observer who observes a process)-or the conclusion can only be that A’s ruler (in the basement) must be longer compared to B’s ruler. Only in this way can A and B both assert that ‘c’ is the same for both (even though ‘c’ is not comparably the ‘same’). The modified theory of relativity (MTR) asserts that everything, both time, distance, matter as well as the ruler always stretch proportionally due to relativistic influence which means that the ruler is a proportional variant. The prevailing theory of relativity does not address whether the ruler is a variant or not. Nevertheless, GR asserts that the path of the photon reaching A and B must be different (which is contradicted by the thought experiment which clearly demonstrates that such a postulate makes no logical sense at all). The two different interpretations of the thought experiment (mentioned above) are essentially also according to the (real) cause of the Perihelion Precession Anomaly of Mercury (in the following PPAM). Again, we will face the same dilemma: GR asserts that PPAM is caused by variation of the relativistic path / orbit that Mercury follows. However, the MTR asserts that even though it is true that time and distance are relativistic factors of the orbit of Mercury, hence the consequence simply is that the orbit distance (and time) is only measured relatively different simply because rulers are relativistic variants and not because any relativistic, real changing of the path / orbit of Mercury is taking place. One option is therefore that the cause of the PPAM is off course: distance deformation. Because the ruler (distances) near the Sun is relatively more stretched compared to further out, the distance to the sun is relatively smaller by perihelion (as expected), and therefore stronger acceleration due to gravity. However, it is much more likely that PPAM is caused by: Effective Dark Flow Acceleration, (EDFA), exactly like the Flyby anomalies 18. At least the following effects contribute. To be able to calculate the influence of the EDFA effect that affects the orbit of Mercury when the planet follows the orbit path from “inclination low” to ”inclination peak” (Figure 27), the following equation has to be used; 1m/s2-1m/s2/sqrt(1-v2/c2) = but only to the degree that Mercury moves opposite DFA. After reaching the “inclination peak”, Mercury moves “downwards” and will have gained back the lost speed when reaching “inclination low” (Figure 27). To calculate the perihelion precession consequences in further detail, advanced software is required. The exact influence is a beast to calculate without suitable software. Obviously, the “curvature of space” ‘concept’ is no longer necessary-therefore also no reason to invent it. In addition, also an RR and ASAM influence must be taken into account. This aspect will be covered in the following chapter: XV. One would think that objects following orbit A (for example the Earth orbiting the Sun) must decelerate due to RR. However this is not true. A certain resulting force is able to counteract a certain resulting RR and hence maintain a certain resulting speed. 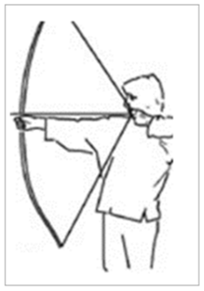 (Illustrated by Figure 24). The resulting force and the resulting RR most always be understood based on an overall perspective as explained and illustrated in the chapter X: “Absolute Motion, Acceleration and RR”. As long as the resulting force (that includes the centripetal force and DFA etc.) acting on earth is stable, the absolute speed of the Earth is also stable, and therefore the orbit of the Earth is also stable. If for example the solar system is also moving more or less perpendicular relative to the DFA axis, we will refer to this as: Additional Sideward Absolute Motion. (Hereafter ASAM). Such motion will cause Apsis anomalies. 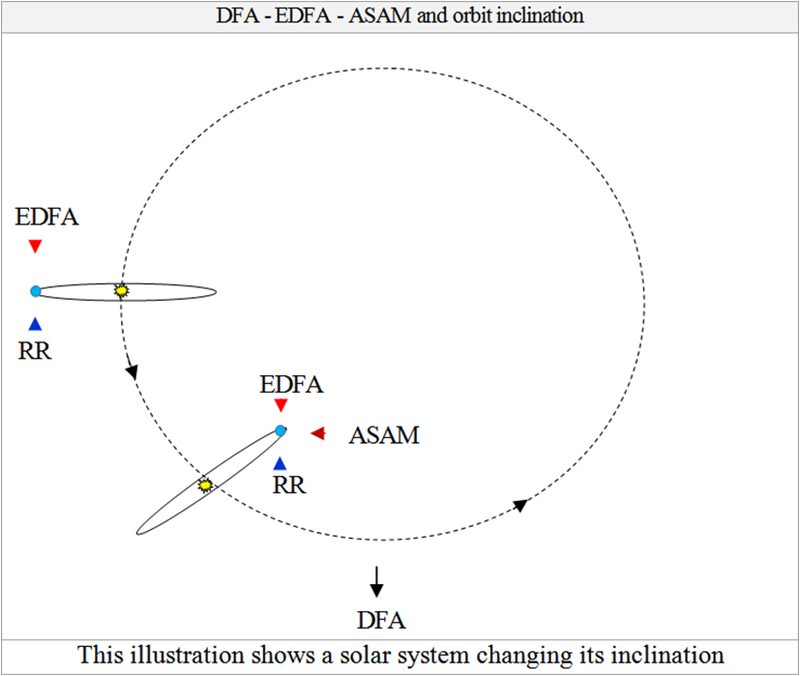 Objects following orbit A (in such an ASAM scenario) will decelerate when moving towards a direction that will increase the absolute speed of the solar system as it will also be affected by sideward RR. Such an object will regain the potential gravitational energy as soon as the object again is moving opposite the RR direction. 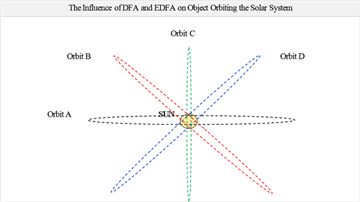 Objects following orbit B and D will both decelerate due to EDFAs when moving (more or less) north. In addition, the orbit inclination will change, however, these objects will gain back the lost energy when moving south. The result is Apsis anomalies. 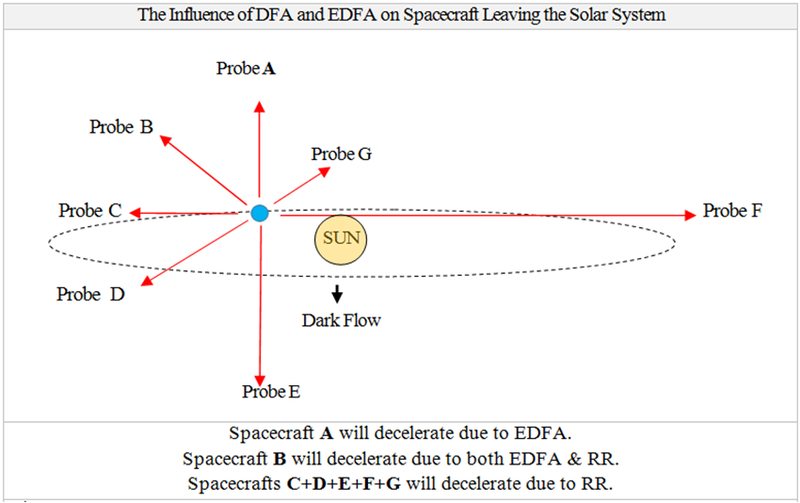 Objects following orbit C will decelerate due to EDFAs when moving north, however, these objects will gain back the lost energy when moving south. The result is Apsis anomalies. The illustration shows how Acceleration Effective Dark Flow (EDFA) and RR is responsible for orbit inclination anomalies. Similar inclination anomalies must be expected due to the ASAM effect. This will be further explained below and illustrated by Figure 31. 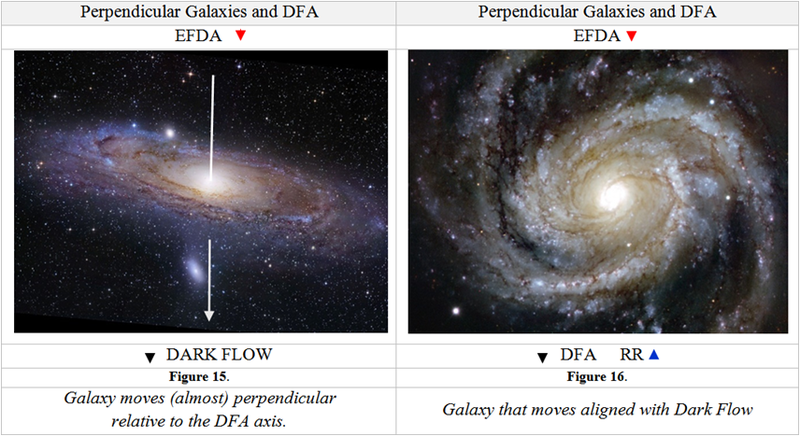 Stars of a galaxy that do not follow a fully perpendicular path relative to the DFA axis (Figure 32) will-when they move (more or less) north-lose speed (caused by EDFA). From a local perspective, it will look like kinetic energy is lost, but from an absolute perspective, kinetic energy is temporarily converted to potential gravitational energy. As soon as the stars move again (more or less) downwards (south), potential energy is again reconverted to kinetic energy, also caused by EDFA. Therefore, EDFA is responsible for the relatively large orbit speed of stars. If all galaxies and all solar systems only would move straight towards the Dark Flow Direction, all these orbits would be exactly perpendicular relative to the dark flow axis, and all would collapse. 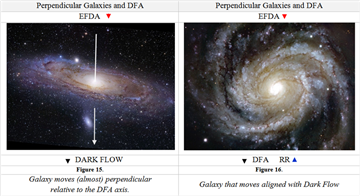 However, galaxies and solar systems are not always moving straight towards DFA but also sometimes, in addition, sideward (Figure 34) relative to the DFA axis. Therefore, sideward additional RR will also affect these objects. If sideward RR dominates, it forces orbits to align with the DFA axis. In addition, during periods when perihelion ‘collides’ with RR, orbits will be forced ecliptic. 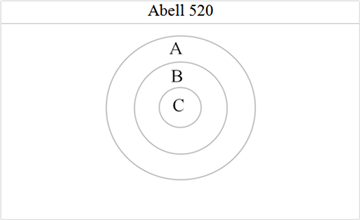 During periods where aphelion ‘collides’ with RR, orbits are forced circular. However, because Aphelion-RR-collision periods last longer, the dominating influence is that planet orbit during sideward-moving-period will be forced circular. First the inner and then the outer planets. The acceleration is weak, most of the time on the minus 10 and 11 scale. This also means that a very special inclination pattern must be seen in the cosmic web, which also is exactly what we see. The magnitude of ASAM affecting our solar system will of course contribute to solving unsolved mysteries related to ice ages. 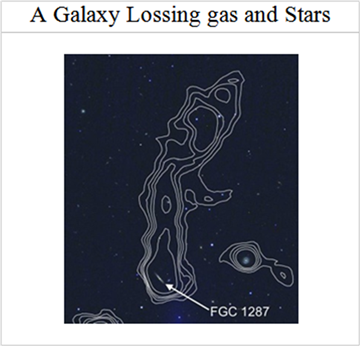 In the wake of FGC1287 follows a tail of gas and stars which get lost. 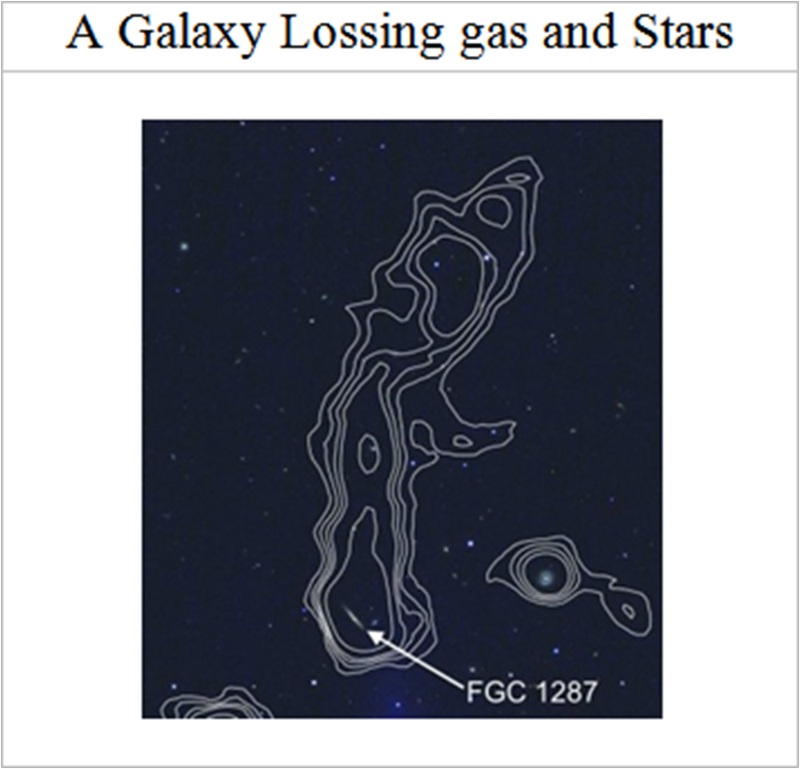 The cause of such losses is periodic galaxy collapses (due to periods dominated by mainly aligned inclination relative to DFA). During such periods, mass (stars etc.) is forced towards the centre of a galaxy whereby the central mass density increases significantly and therefore causes a very fast central orbit speed. However, when either the orbit inclination of the galaxy is changing or when a part of the inner orbital mass is changing its inclinations, the centrifugal force and the already fast internal orbit speed can cause mass to be ejected from the centre 20. The relatively large orbit speed of stars in galaxies is not caused by so-called dark matter but by DFA. During periods where orbit inclination of galaxies is not perpendicular relative to the DFA direction, DFA will periodically have an accelerating or decelerating impact on orbiting stars. 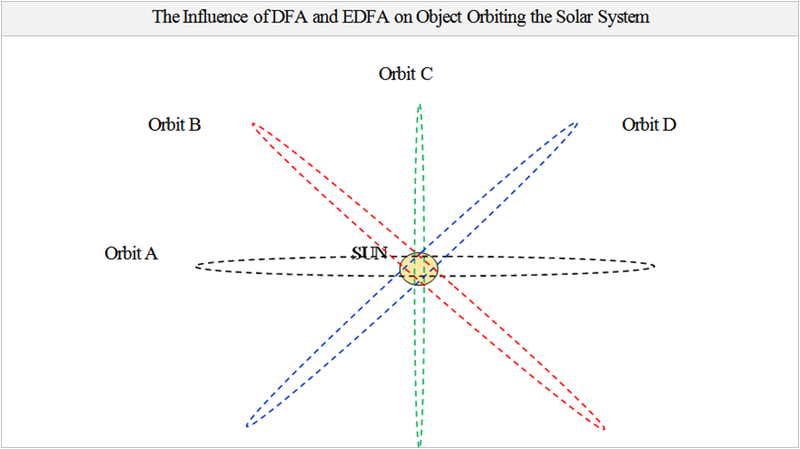 DFA is hence responsible for both large kinematic energy of orbiting stars as well as responsible for preventing stars to escape from their orbits. However, during periods of perpendicular orbit inclination (relative to the DFA axis), DFA can no longer influence, whereby orbiting stars solely are affected by the relative weak gravity of the host galaxy. This allows the centrifugal force to force peripheral stars further outwards, and hence how the peripheral ring of stars is caused. On the one hand, because gravity (most of the time) is stronger near the centre due to larger mass density, an inner core of stars is typically not affected enough by the centrifugal force, thereby leaving a dense inner core of stars to remain near the centre (almost) unaffected (Figure 36 a). On the other hand, the centrifugal force can sometimes also outplay the stronger central gravity and hence cause an inner ring of stars (Figure 36 b) 21, 22. The mass of the 2 illustrated galaxies is the same, but the size is very different. The cause of the very different sizes is due to the different perpendicular motion relative to the DFA Axis. Galaxies can periodically collapse and periodically extend their size. As mentioned in the introduction, the universal field of gravity is always changing, caused by 2 factors: on the one hand, the dissolving field of gravity from a previous universe, and on the other hand, recreation of the universal field of gravity after a new universe is created. Spooky Alignment of Quasars Across Billions of Light-years is one of the latest discoveries. The cause of this is already explained in detail above. So far, we have only discovered that quasars are involved, but the truth is that all galaxies behave like this, however, it is only possible to measure the orientation of quasars. (Fig.ure 41) 25. All motion against any ASAM (RR direction) will cause the clock to tick slower, and any motion opposite any ASAM will cause the clock to tick faster. Therefore, we should expect an undiscovered annual as well as diurnal time dilation variation anomaly, even here on Earth. Whenever the absolute motion increases, we should expect slower clicking clocks, and when the absolute speed is reduced, we should expect faster ticking clocks. The illustration above (Figure 42) is only temporary and not correct: the purpose is only to illustrate ASAM and how signals coming from different motion reference frames can reveal that new aspect of science. Further research (including measurement and experiments) is necessary to determinate exactly from which (sideward) direction relativistic effects/variation deviate from our expectations. 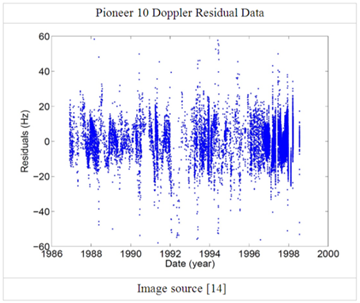 A true understanding of the annual (and diurnal) anomalies, for example hidden in the Pioneer 10 and 11 signals, can contribute to reaching a much better understanding of this aspect of science. Also, data from space probes (clocks) orbiting the Sun (for example a clock on Mars) or data from objects trajectory (clocks) leaving the solar system could be interesting to analyse. 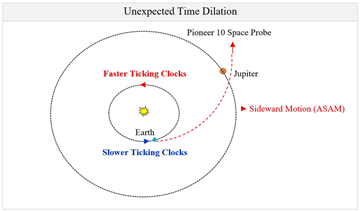 Even an experiment (time measurement with atomic clocks) here on earth (or even better ISS/+Earth) can help us determine in which sideward direction the solar system moves (notice absolute motion). Earth orbiting satellites (clocks) more or less orbiting in the plan of equator are not worth much because these always only follow the same direction around the Sun as the Earth does. Annual time dilation caused due to orbit motion of the Earth straight opposite any ASAM direction can be calculated as: ´/sqrt(1-297802/2997924582)-1 = 4.93e-9s. Diurnal time dilation (due to the rotation of the Earth) also contributes to either additional or reduced ASAM-1/sqrt(1-4602/2997924582)-1 = 1.18e-12s. 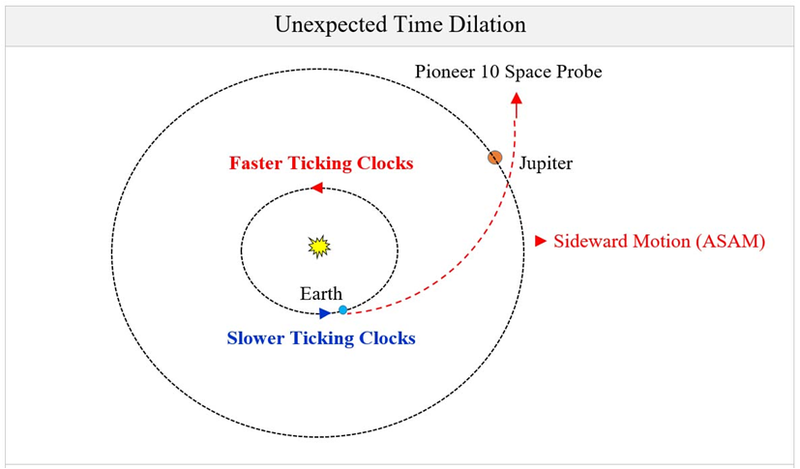 Annual and Diurnal time dilation was found in the Pioneer 10 and 11 data 15, 19, but misunderstood, and was swept under the carpet by NASA 16. The discovery that many small galaxies throughout the universe do not 'swarm' around larger ones like bees do but 'dance' in orderly disc-shaped orbits is a challenge to our understanding of how the universe formed and evolved. "Everywhere we looked we saw this strangely coherent coordinated motion of dwarf galaxies. From this we can extrapolate that these circular planes of dancing dwarfs are universal, seen in about 50 percent of galaxies," said Professor Geraint Lewis. "This is a big problem that contradicts our standard cosmological models. It challenges our understanding of how the universe works including the nature of dark matter." Source: 26, 27. Comment: Peripheral stars of a galaxy take longer to change the inclination compared to the inner stars. Because EFDA is speed-dependent and inner objects of a system are moving faster compared to peripheral objects, the inner and outer change of inclination does not follow each other. In addition, the orbit distance near the periphery is greater whereby a larger distance has to be travelled. This explains the cause of all these “misshapen outer orbits”. An illustration of the orbits of the new and previously known extremely distant solar system objects. It is believed that the clustering of most of their orbits indicates that they are likely to be influenced by “something massive and very distant”, the proposed Planet X. However, it is the exact same “EDFA signature” that must be expected as that change of inclination takes a longer time for peripheral objects compared to inner object (planets). In short, the same law of nature is responsible for satellite galaxies following unexpected orbital inclinations 28. Evidence 10. Jupiter may have once migrated closer to the Sun. "It's like Jupiter bowled a strike through the asteroid belt," said Francesca DeMeo, who did much of the mapping as a postdoc in MIT's Department of Earth, Atmospheric and Planetary Sciences. "The trickle of asteroids discovered in unexpected locations has turned into a river. We now see that all asteroid types exist in every region of the main belt," researchers wrote in their paper in the Journal Nature. Source 29. Comment: Periodical, large orbit eccentricity is expected according to the MTR theory. The Jupiter atmosphere probe found high levels of argon, krypton, and xenon. 2. This discovery presented a problem: heat drives off these noble gases during planetary formation. Huge quantities of argon, krypton, and xenon in the present Jovian atmosphere indicate that Jupiter formed in a region with temperatures below-406 °F; temperatures that could exist only beyond the orbit of Pluto. Jupiter’s cold origin means that the solar system’s largest planet must have migrated a long way, starting more than four billion miles from the Sun and ending up just 465 million miles from the Sun. Source 30. Comment: Periodical orbit collapse is expected according to the MTR theory. The planet, called WASP-18b, belongs to a now-common class of extrasolar planets known as ‘hot Jupiters’-massive planets that are thought to have formed far from their host stars and migrated inwards over time. WASP-18b is so massive and so close to its star-only about three stellar radii away-that tidal interactions between star and planet should have caused the planet to spiral inwards to its destruction in less than a million years. Source: 31, 32. Comment: Periodical orbit collapse is expected according to the MTR theory during periods when the orbit inclination of a solar system is more or less parallel to the Dark Flow Direction. Evidence 13. Where do the oceans come from? The study headed by Adam Sarafian of the Woods Hole Oceanographic Institution (WHOI) in Woods Hole, Massachusetts, found that our seas may have arrived much earlier on our planet than previously thought. The study pushes back the clock on the origin of Earth's water by hundreds of millions of years to around 4.6 billion years ago when all the worlds of the inner solar system were still forming. "Some people have argued that any water molecules that were present as the planets were forming would have evaporated or been blown off into space," said study co-author Horst Marschall, a geologist at WHOI. For that reason, he said, scientists thought that "surface water as it exists on our planet today must have come much, much later-hundreds of millions of years later." Source 33. Comment: The small inner planets (Mercury, Venus, Mars and the Earth) may very well once have been moon orbiting a giant planet (a hot Jupiter like Wasb-18) and were forced inwards due to the law of nature described above. The tidal interactions finally pulled the giant down on the Sun. Hundreds of moons may have had the same destiny. The moons orbiting such a giant would finally have had extremely eccentric orbits. Some moons could have been impacted differently by the tidal force and could have survived thanks to “flyby manoeuvres” (very short perihelion distant) and correct timing-and simply continued to orbit the Sun without their host planet. So Earth and Venus could once have been icy moons like the moon: Europa orbiting Jupiter. Therefore, not only the water but also the Earth itself could very easily have been created much further out which explains why the water had not evaporated. Furthermore, the Earth could have captured our moon that also once was escaping the destruction of their common mother planet, and one more mystery could be solved. Evidence 14. Is Mercury an alien planet? Mercury’s strange past has always been something of a mystery to scientists. While the planet appears geologically dead today, astronomers believe it had a violent volcanic history. Now, a U.S. group has linked this turbulent past to a theory that the planet formed further out in the solar system and later migrated in. Source 34. Imagine an inner central area of a galaxy or cluster of galaxies divided into 3 successive areas. One area furthest out ‘A’. One area further in ‘B’. And one area even further in ‘C’. The matter that is in area ‘A’ is stretching the elastic space from all directions. The matter that lies deeper in the galaxy (area ‘B’) lies ‘behind’ the outer matter (area ‘A’) and thereby affects space that is already somewhat affected (by area ‘A’). The matter that lies in area ‘B’ and even deeper (in area ‘C’) therefore lies in areas that are becoming more and more deformed as one moves inwards. In short, Area C has the strongest lensing effect. The further we get back in time, the stronger an effect we will see. Furthermore, matter can contribute to lensing effect although billions of lightyears away and therefore also varies significantly from place to place. So-called Dark matter is not necessary to explain the large variation. 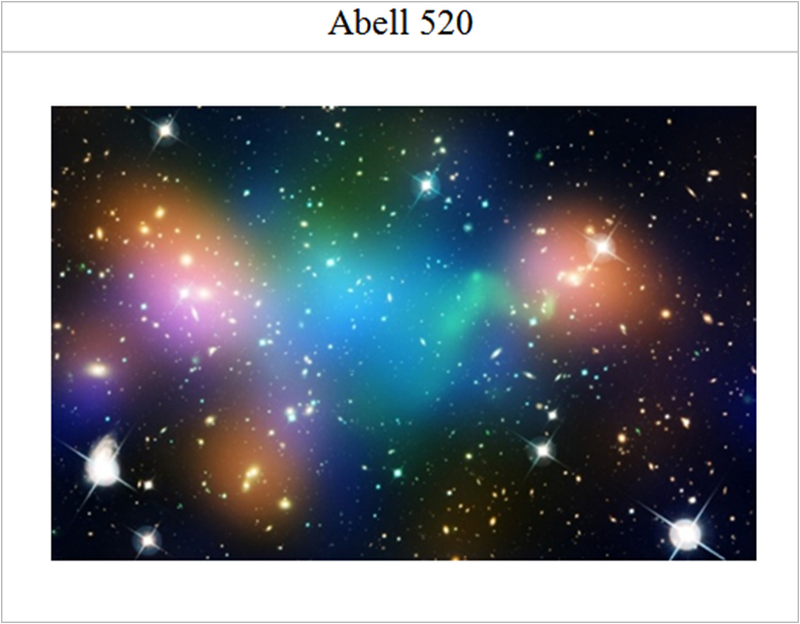 Using gravitational lensing, a team of scientists believed they have observed dark matter in Abell 520. The dark matter is not behaving as predicted and is inconsistent with the observations of the Bullet Cluster, a colossal collision between two galaxy clusters which is recognized as an example of how dark should behave. Astronomers using data from NASA’s Hubble Telescope have observed what appears to be a clump of dark matter left behind from a wreck between massive clusters of galaxies. The result could challenge current theories about dark matter that predict that galaxies should be anchored to the invisible substance even during the shock of a collision. Source: 35. The four newfound galaxies shine much more brightly in infrared light than in visible wavelengths which is how the infrared-sensitive Spitzer was able to detect them. The research team still is not sure why they are so strikingly red. There are three main reasons why a galaxy may appear red, researchers said. First, it may be extremely dusty. Second, it could contain many old, red stars. Or third, the galaxy may be extremely distant, in which case the expansion of the universe has stretched its light to very long (and very red) wavelengths. All three of these factors may be in play in the case of the newfound galaxies, researchers said. But they are not sure since much about them remains mysterious. Comment: The tension in the structure of space was extreme 13.7 billion years ago (due to tension caused by the previous universe). Not only time and space were extremely stretched, matter was as well. The redshifted electromagnetic spectrum is therefore evidence revealing the different tension from this period. A research team using the ALMA has detected the faintest millimetre-wave source ever observed. By accumulating millimetre-waves from faint objects like this throughout the Universe, the team finally determined that such objects are 100% responsible for the enigmatic infrared background light filling the Universe. By comparing these to optical and infrared images, the team found that 60% of them are faint galaxies, whereas the rest have no corresponding objects in optical/infrared wavelengths, and their nature is still unknown. "However, we have no idea what the rest of them are. I speculate that they are galaxies obscured by dust. Considering their darkness, they would be very low-mass galaxies", Masami Ouchi explained passionately. "This means that such small galaxies contain great amounts of dust. That conflicts with our current understanding: small galaxies should contain small amounts of dust. Our results might indicate the existence of many unexpected objects in the distant Universe. 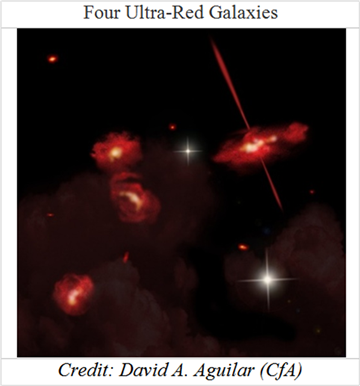 We are eager to unmask these new enigmatic sources with future ALMA observations." Comment: The tension in the structure of space was extreme 13 billion years ago (due to tension caused by the previous universe). Not only time and space were extremely stretched, matter was as well. 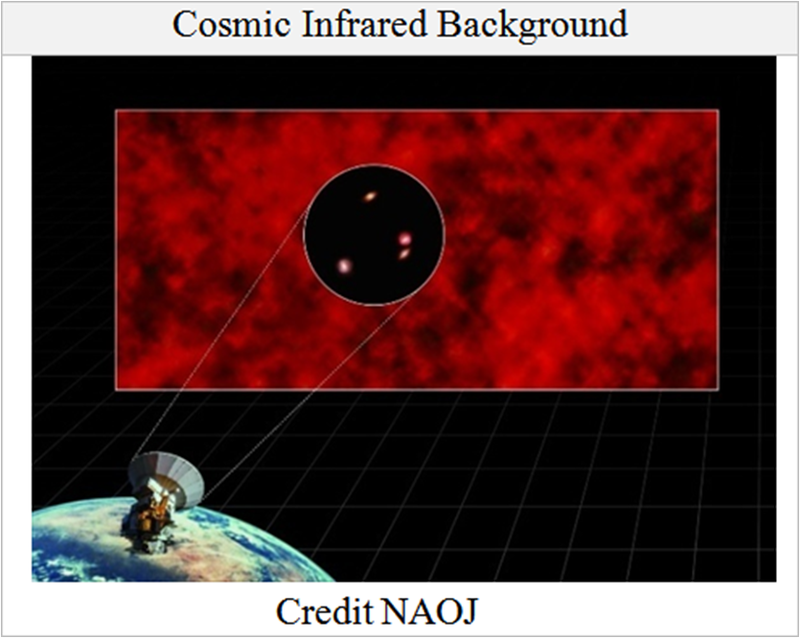 Some of the infrared background could be caused by emitted light from objects that once existed in the previous universe or from objects much further away that survived the Big Crunch 37. A huge, unknown object entered the solar system in 2017 (at 87.3 kilometres per second). During that and right after when leaving our solar system again, the observed trajectory was not as expected. The simple explanation is partly that EDFA will prevent any escape from Dark Flow 38, - and partly that Oumuamua must have gained a push due to release of retracted, potential, kinetic energy (according to principle 3 described above). At such large speed (that applied to Oumuamua) the influence of RR and EDFA must be calculated based on an estimated absolute motion reference frame. If we will assume the absolute speed of the Solar system is about 600 km/s and the absolute speed of Oumuamua 87,3 km/s faster (hence 687 km/s), The common force of release of retracted, potential, kinetic energy and the force of EDFA, that affected Oumuamua (right after perihelion when Oumuamua was changing course) is about 0,000001 m/s2 , - enough to explain the mysterious acceleration out of the solar system affecting Oumuamua . Already in 2019 / 2020, we will see that the special theory of relativity will see its first crack. At first, it will be necessary to reconsider the interpretation of especially one of the foundations of the theory of relativity which has already been mentioned above, i.e. the misinterpretation of the Michelson-Morley experiment. An observer at rest relative to the moving light clock B will see (conclude) that due to the speed of the clock, light (photons) must follow a zig-zag path and hence travel a longer distance relative to the distance photons travelling in light clock A at relative rest. Based on that thought experiment, Albert Einstein postulated that the speed of light is the same for all observers and concluded further that time therefore must tick slower for the moving clock, allowing photons that follow this clock to travel a longer distance. Even though the conclusion is ‘true’ (seen from a narrow perspective at relative rest), it is also true that the conclusion of this thought experiment only leads to conflicts with the conclusion of the thought experiment described above (page 40) and several more. It could very well have been a great mistake to reject the aether theory. If photons need a media to be able to travel, that media (aether) could very well be of the exact same nature as deformable space characterised by gravity. At least there are good reasons to be suspicious of whether or not the aether (deformed space) follows the motion of the earth. If so it is incorrect to add the vertical travel length of an up-down moving photon to the horizontal travel length of a light-clock (illustrated by Figure 51). Special relativity is based on the mistake of adding the motion of a reference frame to the motion of light. This is why several aspects of the special relativity have so many irrational and illogical conclusions and consequences (extremely hard to digest for many). Different tension in space always “converts” to different reality transformation. True additional speed is simply adding more tension to space and therefore causing the well-known transformation effects. This is all reality is about. This is nothing but simple local proportional transformations, very easy to grasp. Of course, one observer will be able to discover a gamma ray or light burst (etc.) before or after another observer, but this does not mean that relativity necessarily has to be mysteriously illogical in any sense. Einstein simply made it more complicated than necessary. Given that we will be forced to acknowledge that Dark Flow is a reality, our world view is literally in free fall. The universe therefore finds itself in a verifiably anisotropic motion (Dark Flow) whereby many questions will arise which will require answers. One of the biggest and most pressing questions therefore is to find the answer to whether or not the Allais Effect may be the proof that a significant anisotropic acceleration is linked to Dark Flow. Thus, we rather quickly (at least in theory) will be forced to relate to whether or not Earth’s acceleration in a Dark Flow is unhindered and therefore whether or not Earth sooner or later will reach (the unthinkable and impossible) speed, “c”. Intuitively as well as logically, we know that this is impossible. “Something” must stop Earth before it reaches “c”. Were we close to finding that “something” (a mysterious, braking force) already when Pioneer space probes 15, 19 were sent into space several decades ago? Were we on the threshold of acquiring new knowledge already back then? And could this have shown us that relativistic transformation is indeed a process? A knowledge which, unfortunately, was swept under the carpet by NASA 16. The short answer is that elastic property of space and energy is woven together in a process whereby the nuclear energy, kinetic energy and potential gravitational energy is part of one and the same process. This is the process responsible for the Lorentz transformations as well as consequences we still have not understood. The main thread of the theory can even be followed further-even deep inside the Earth-and also solve why all planets give more energy than they received from the Sun and hence also contribute to solving why the curves of the Earth's magnetic field and ice ages coincide 39. Atomic Clock Will Fly to Space Station in 2016: http://www.space.com/26897-pharao-atomic-clock-space-station.html. Maurice Allais L'ANISOTROPIE DE L'ESPACE http: //ether-wind.narod.ru/Allais_1997/Allais_1997_1.pdf. Allais Effect Measurement Listed www.science27.com/allais. The "Dark Flow" & Existence of Other Universes--New Claims of Hard Evidence http://www.dailygalaxy.com/my_weblog/2013/06/the-dark-flow-the-existence-of-other-universes-new-claims-of-hard -evidence.html. F. Atrio-Barandela, A. Kashlinsky, H. Ebeling, D. J. Fixsen4, D. Kocevski., “Probing the Dark Flow signal in WMAP 9 yr and PLANCK cosmic microwave background maps.” arXiv: 1411.4180v2 [astro-ph. CO] 22 Jul 2015. A. Kashlinsky, F. Atrio-Barandela, D. Kocevski, H. Ebeling “A measurement of large-scale peculiar velocities of clusters of galaxies: technical details”. A measurement of large-scale peculiar velocities of clusters of galaxies: https://www.researchgate.net/publication/1775888_A_measurement_of_largescale_peculiar_velocities_of_clusters _of_galaxies_Technical_details¨’. Yang, Xin-She; Wang, Qian-Shen Gravity Anomaly During the Mohe Total Solar Eclipse and New Constraint on Gravitational Shielding Parameter http://adsabs.harvard.edu/abs/2002Ap&SS.282.245Y. Maurice Allais L'ANISOTROPIE DE L'ESPACE (page 206-212) http://ether-wind.narod.ru/Allais_1997/Allais_1997_1.pdf. Jean-Bernard DELOLY-22/04/2016 “Continuation given to Maurice Allais's experimental works State of the situation (2015) http//www.fondationmauriceallais.org/wp-content/uploads/2016/05/situation_allais_2015-trad.pdf. D. C. Mishra and M. B. S. Vyaghreswara Rao, “Temporal variation in gravity field during solar eclipse on 24 October 1995,” Current Science, vol. 72, no. 11, pp. 782-783, Jun. 1997. T. J. Goodey A.F. Pugach D. Olenici ““CORRELATED ANOMALOUS EFFECTS OBSERVED DURING A SOLAR ECLIPSE”. A. F. Pugach1 and D. Olenici2 Observations of Correlated Behavior of Two Light Torsion Balances and a Paraconical Pendulum in Separate Locations during the Solar Eclipse of January 26th, 2009. Bjarne Lorenzen The Cause of the Allais Effect Solved https://www.scirp.org/journal/PaperInformation.aspx?PaperID=76756. 12 year misconception?”arXiv.org > physics > arXiv: 1307.0537. Unsolved Kinematic Anomalies listed: www.science27.com/orbit. John D. Anderson, Philip A. Laing, Eunice L. Lau, Anthony S. Liu, Michael Martin Nieto, and Slava G. Turyshev. 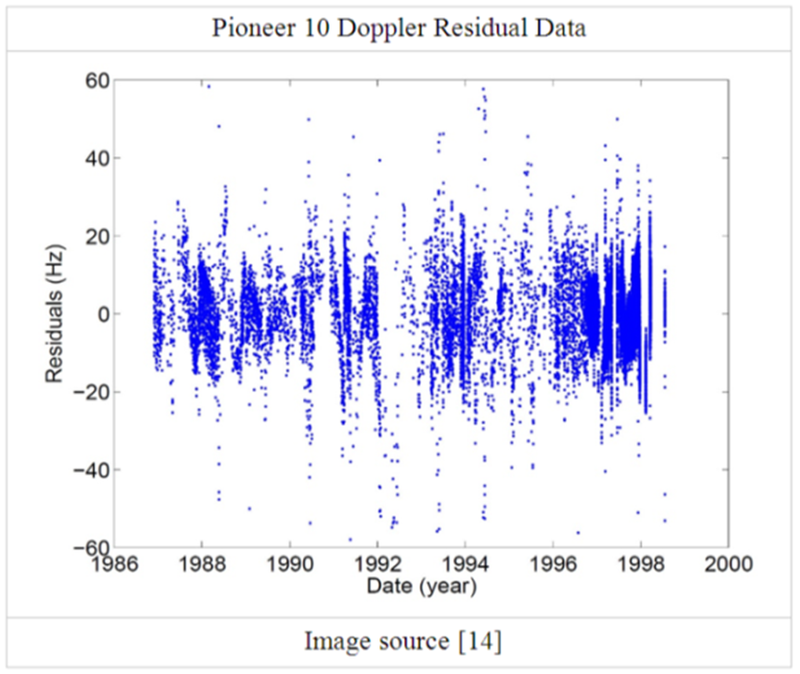 Study of the anomalous acceleration of Pioneer 10 and 11. Mysterious dance of dwarf galaxies may force a cosmic rethink https://www.sciencedaily.com/releases/2014/07/140721100418.htm. Half of Andromeda’s satellite galaxies orbit in a mysterious diskhttps://arstechnica.com/science/2013/01/half-of-andromedas-satellite-galaxies-orbit-in-a-mysterious-disk/. Hunt for Planet 9 reveals extremely distant solar system objects https://astronomynow.com/2016/08/30/hunt-for-planet-9-reveals-extremely-distant-solar-system-objects/. Jupiter may have once migrated closer to the Sun http://economictimes.indiatimes.com/industry/jupiter-may-have-once-migrated-closer-to-the-sun-scientists/articleshow/29601555.cms?intenttarget=no. Extrasolar Hot Jupiter: The Planet That 'Shouldn’t Exist https://www.sciencedaily.com/releases/2009/08/090827132901.htm. Astrophysicists puzzle over planet that's too close to its sun http://articles.latimes.com/2009/aug/27/science/sci-planet27. Mystery of Earth's Water Origin Solved http://news.nationalgeographic.com/news/2014/10/141030-starstruck-earth-water-origin-vesta-science/. Is Mercury an alien planet? http://www.dailymail.co.uk/sciencetech/article-2599649/Is-Mercury-migrant-planet-Volcanic-past-suggests-closest-world-sun-formed-OUTSIDE-solar-system.html. Dark Matter Core of Abell 520 Differs from Bullet Cluster https://scitechdaily.com/dark-matter-core-of-abell-520-differs-from-bullet-cluster. The Cause of the Earth’s Magnetic Field www.science27.com/earth. Lorenzen, Bjarne. "Modified Theory of Relativity (MTR)." 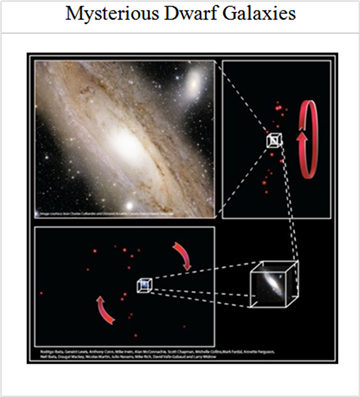 Frontiers of Astronomy Astrophysics and Cosmology 4.1 (2018): 32-65. Lorenzen, B. (2018). Modified Theory of Relativity (MTR). Frontiers of Astronomy Astrophysics and Cosmology, 4(1), 32-65. Lorenzen, Bjarne. "Modified Theory of Relativity (MTR)." Frontiers of Astronomy Astrophysics and Cosmology 4, no. 1 (2018): 32-65.